There’s certain things like this you’ve got to kind of let the dust settle. So the dust settled, they lifted the ban, I’m very happy with that. But you’ve got to be careful when it comes to…see, here’s the thing when it comes to leaking information. People say ‘He was just doing his job reporting,’ I get that, I understand. But you have to realize this isn’t news that is not going to get out, that’s going to affect people’s health. This is a private company that’s spending millions of dollars to promote these events. All you’re doing is getting it on you. ..All you’re doing if you’re scooping it is shining the attention on yourself. What I like Ariel for is not him shining the attention on himself. What I like Ariel for is I think he’s a very bright guy, and I think he’s very insightful about fights and strategies and things along those lines. So I don’t think it’s important that he breaks the news before the UFC does, and if the UFC doesn’t want him to do that, because this is private information and a private company and they’re trying to control the press release, I don’t buy that it’s necessarily under the guise of journalism. There’s some f***ery with that. Because we’re not talking about ‘Oh, he found out about some horrible thing that happened that somebody’s covering up,’ or ‘He found out about corruption in government,’ ‘He found out about a person who got shot by the police,’ this is not that kind of news. This, they’re going to release it, you’re just trying to do it before they do. 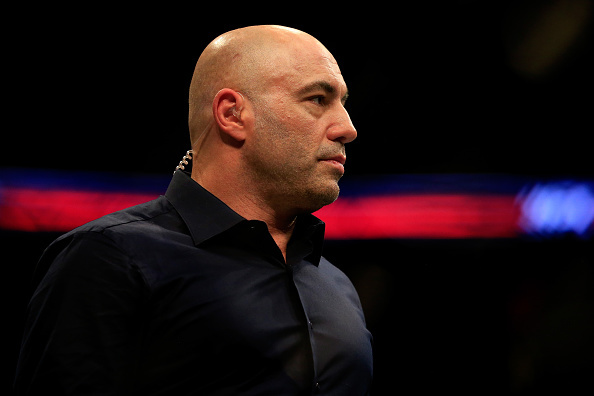 Rogan’s right that fight announcements aren’t exactly earth-shattering journalism, but if anything, that’s another reason why the UFC’s reaction against Helwani’s reporting of them was so over the top. Moreover, the rest of Rogan’s arguments here all fall incredibly short, and they show that he doesn’t understand journalism very well. The goal for Helwani (or for any other journalist covering MMA) isn’t to let the UFC make their news announcements in the choreographed way that they desire; that’s the company’s goal, not the media’s. Beyond that, it is very much Helwani’s job as a MMA journalist to report on upcoming fights, and if he’s able to do that before the company makes their grand choreographed release, so much the better for him and for his site. Breaking news scoops like that most certainly are journalism, and they can drive a lot of traffic. That’s often what pays for the analysis and the other aspects of coverage Rogan claims to enjoy. The debate here over journalism versus company-orchestrated spectacle is an interesting one, though, and it’s one we’ve seen in a few other sports arenas, particularly with the discussion of tipping picks at the NFL and NBA drafts. For example, at the NFL draft, ESPN and NFL Network have agreed not to report picks (either on TV or social media) before they’re made on-air, and that is a case of networks limiting their reporters’ power to promote corporate spectacle, but that’s one that’s also done with an eye to the viewers who have emphatically insisted they don’t want to know that information before it happens. There are also options for people who do want the news as it happens, not as it’s presented for TV, namely reporters unaffiliated with those networks; Yahoo’s Adrian Wojnarowski has done an outstanding job of this at the NBA draft, and even though ESPN has allowed its reporters to tip NBA draft picks (perhaps in response), Wojnarowski still usually wins. Moreover, holding draft picks is usually a case of minutes rather than hours, so it’s not really a huge blow to fans on the journalism side (and with so many fans preferring to see picks on TV, it works out). Still, we don’t see the NFL or the NBA try to throw out or ban reporters like Wojnarowski or Jason La Canfora for scooping their televised announcements; they’d be laughed at if they did. What Rogan’s commentary here perhaps really illustrates is just how closely tied to the UFC he is. He’s not thinking about this issue in terms of a fight fan who wants to know matchups as soon as possible, or as an impartial analyst evaluating those matchups. He’s thinking about it in terms of what’s best for the company. That’s more of a journalistic problem than anything Helwani did.